The 2018 Graduation and Prize Giving Ceremony will be held on Wednesday 21 November at Canterbury Cathedral. Doors to the Cathedral will open for guests to enter at 6.30pm. From mid-September 2018 onwards, Graduands will receive an invitation email once they become eligible to attend. There are no sheltered areas within the precincts surrounding the Cathedral, so please consider this as guests will need to queue outside prior to admission into the Cathedral at 6.30pm. Seating within the Cathedral is unreserved. The ceremony registration desk will be open from 4.00pm to 5.30pm in the Kentish Barn reception area, which is located within the International Study Centre. Gowns can be collected from Ede & Ravenscroft staff in the Clagett Auditorium from 4.00pm to 5.45pm – please note your guests are not allowed entry into the Clagett Auditorium. Graduands should aim to arrive at the Cathedral from 4.00pm onwards, please remember to allow sufficient time for registration, gowning and photography. The Celebration Reception will take place in the Dean John Simpson Room from 4.00pm onwards – admission is strictly limited to those who have reception tickets. Please book your photography requirements online in advance of the ceremony via the Ede & Ravenscroft website. When queuing for photography on the day, please ensure only those who are having their picture taken join the queue for photography with Ede & Ravenscroft, ie guests not having their photograph taken should not accompany graduands. The Cathedral doors will open at 6.30pm for guests to enter and take their seats as directed by the ushers. All graduands should assemble in the Clagett Auditorium no later than 6.00pm for the ceremony procession. Graduands must listen carefully and act upon the instructions given to them by the Procession Marshal; graduands are also reminded that they are representing their chosen profession and therefore a professional demeanor is expected at all times during the event. The procession will start at approximately 6.45pm and the duration of the ceremony will be around 90 minutes. Please note that the ceremony is not considered suitable event for babies or young children to attend. Some seating will offer a restricted views and all seating will be allocated on a first come, first served basis upon entry into the Cathedral. ABDO reserve the right of admission; graduands and their guests deemed to be behaving inappropriately will be prevented from attending the ceremony. Canterbury Cathedral is a sacred place of worship and a working church, so please respect the Cathedral building, clergy and staff. Please note the Cathedral Nave is currently undergoing building restoration works. 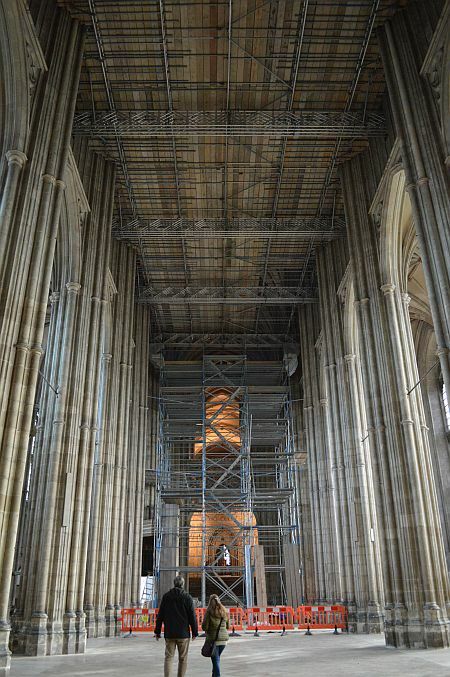 Scaffolders have built a 53 metre long safety deck high above the Cathedral Nave as a platform both for the Cathedral’s conservation team to work from and to catch any dislodged stone and plaster. We trust that the building works will not affect your enjoyment of the graduation.ceremony. Please let us know if you or your guests disabled or require wheelchair access by emailing Deanne Gray at dgray@abdo.uk.com. Photography and video recording is strictly prohibited during the ceremony and within the Cathedral at all times – this also includes photography without the use of a flash. Please ensure mobile phones, iPads, or other mobile devices are turned off for the duration of the ceremony. If you require further information regarding the ceremony please email Deanne Gray at: dgray@abdo.uk.com.